Observation - Lichen on Hawthorn - UK and Ireland. Description: This lichen is on a hawthorn branch in an area of old wood pasture known as Cranbourne Park, which is part of Windsor Great Park in Berkshire. 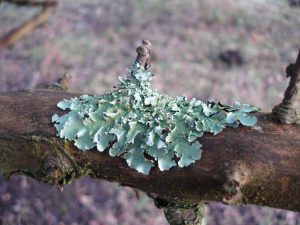 This lichen is on a hawthorn branch in an area of old wood pasture known as Cranbourne Park, which is part of Windsor Great Park in Berkshire.